Are you ready to celebrate another book release because that’s exactly what we’re doing (again) today! Continuing the fun, Kathryn McConaugy has released her Snow White retelling with her story Overpowered in the Magic Mirrors Collection. If you enjoy Biblical fantasy, I think you’ll especially enjoy this one! Come learn about Yotam and her intriguing story below. After a blood crime sends Taliyah bat Shammai running from her home, she flees into the hill country. Yet the hills are no place for a woman traveling alone. Strange dreams of talking jackals and mysterious mists are the least of her worries—for she knows that the Avenger of Blood will be following close behind her. Barred from the Refuge by the circumstances of her crime, Taliyah thinks that her best chance of survival may lie with Cypress and his band of mercenaries: giant Cedar, hardened Thorn, boasting Vine and tidy Fig. Unsure whether to stay or go, Taliyah is reassured by the arrival of a young man with a mysterious past and cardamom-colored eyes. Something tells her that he is a man she can trust. Yet when a new king rises at the city of the Dawn, Taliyah and the seven criminals are called to fight a battle they cannot win. Will the outlaws stand fast in the face of certain death? Can Taliyah ever find safety again? Even escaping the battle may not save her… for the Avenger is still coming. — Loosely inspired by the tale of Snow White, this Christian fantasy novella is set in a magical version of ancient Israel. 135 pages (33,000 words) plus 65 pages of bonus features including cut scenes, a bonus short story, author interview, and more. For ages 12 and up. Favorite proverb: The fear of the Lord is the beginning of wisdom, and before honor comes humility. Appearance: Tall and lanky, with light brown eyes and sun-lightened brown hair that covers the tops of his ears and the nape of his neck. He has a pleasant face made distinctive by a knobby nose and dreamer’s eyes. He wears clothing of good, brightly dyed material but without embroidery. He is 20 years old. He is usually relaxed and confident. He seems naïve, treating everyone with friendliness. His Role in the Mercenary Band: Yotam and his servant join Cypress’ band a few months after Snow does. The senior members of the band immediately interrogate him for his information about the war in the north. Silently impressed by Yotam’s strategic savvy, Cypress later has the young man help him plan troop dispositions for a battle. However, despite his command potential, Yotam is ready and willing to join in the more mundane work of the band, whether it consist of carrying water or searching for lost goats. 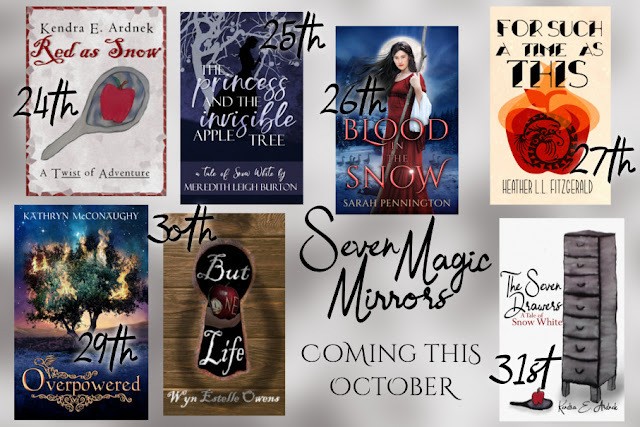 Enter to win the collection of five of the Magic Mirrors in paperback! (US only.) Click the link below to enter! Heather L.L. FitzGerald: Look! My Book is Out! The Language of Writing: Sneak Peek! Unicorn Quester: Character Spotlight – Yotham <— You are here! Dragonpen Press: Guest Post – What is Overpowered?